A graduate degree from an American university used to guarantee a well-paid, stable job back home for many ambitious young Chinese. Huge numbers flocked to the other side of the Pacific to pursue their dreams. They still do, but the year-on-year double-digit growth of Chinese graduates of the past that American schools have come to expect may be over, says a report by the Council of Graduate Schools released on February 9. Although Fall 2016 applications from prospective Chinese graduates to the 500 American and Canadian Council members still grew by 4 percent, actual enrollments flattened out; importantly, these numbers do not yet include the potential downward trend expected due to a Trump presidency. Chinese students comprise the largest national subgroup of first-time graduate enrollments. Any downturn is of serious concern to U.S. university administrators. However, the trend should not be a surprise. Double-digit annual growth of student numbers from a single country, even one as populous as China, was simply unsustainable in the long run. Yet, the current slowdown is more complex than simple demographics. Statistics released by the Chinese Ministry of Education in 2016 show that, of all students enrolled in foreign degree programs at any tertiary level, some three-quarters returned to China upon completion of their education. Of those returnees, 80.7 percent held a Master's degree, while 9.5 percent held a foreign doctorate. Perhaps surprisingly, the U.S. is not the top choice for the majority of Chinese Master's students. Instead, more than 40 percent of returnees with Master's degrees got them at a U.K. school, double the American figure. Experts confirm the prime factor is that Master's courses only take one year in the U.K., which saves time and money. The U.S. remains the prime destination for doctoral degree programs, however. Indeed, in the current international higher education landscape, many non-traditional destinations are catching up. Northern and western European university systems are particularly keen to attract Chinese graduates, highlighting their course offerings in English. 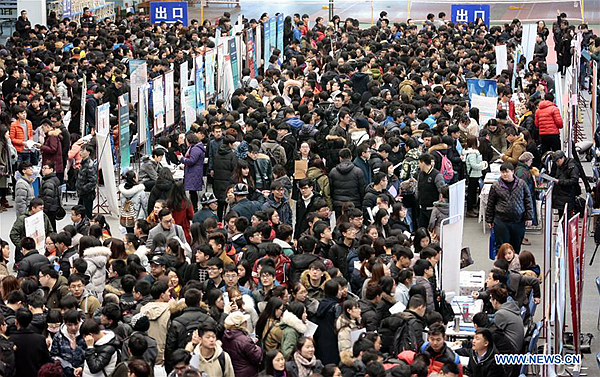 In recent years, education fairs across China's megacities have witnessed increasingly aggressive marketing and recruitment efforts by German and Dutch universities, among others, which are positioning themselves as viable and often lower-cost alternatives to the traditional destinations in the English-speaking world. In a domestic environment defined by somewhat stuttering economic growth, lower-cost options are becoming increasingly popular. Undoubtedly, this combination of external factors has already caused many U.S. graduate programs to suffer. But financial considerations are not everything. The graduate premium associated with a degree from Stanford University or the Massachusetts Institute of Technology remains a strong attraction; however, many prospective Chinese applicants have started to take a rational approach to the investment value of a degree from less prestigious American school. China's significant, continuing investment in its graduate education and the rapidly improving academic research infrastructure are transforming the country's universities into increasingly competitive rivals to overseas counterparts. Many faculty members are themselves returnees, used to running their labs as they were trained to do overseas. For access to a world-class graduate education and state-of-the-art equipment, it is no longer necessary always to go overseas. Large-scale graduate education is relatively new to the Chinese education system. The implementation of policy reform and opening up in 1978 and the introduction of the Regulations of the People's Republic of China on Academic Degrees in 1981 were instrumental in allowing a massive increase in the number of domestic graduate student enrollments. At the present time, more than 2 million graduate students are pursuing higher degrees at Chinese universities. Every year, more than 600,000 new graduates join domestic institutions, with some 500,000 graduating with Master's degrees and 70,000 defending their doctoral thesis each year. Given this enormously improved research capacity, the premium of overseas degrees is being reduced. Overall, there are more returnees than the number of graduate-level jobs available to them, which causes downward pressure on the range of starting salaries. Ministry of Education statistics show that close to 50 percent of Master's degree holders make less than 5,000 yuan a month, while those with doctorates make between 5,000 and 10,000. And in a tightening job market, it pays to stay closer to home to maintain professional networks. U.S. universities' annual budgets may therefore soon need further diversification, with less reliance on Chinese graduate students. They'd better get used to the new normal in international higher education, it seems. Richard de Grijs is a Dutch professor of astrophysics at the Kavli Institute for Astronomy and Astrophysics (Peking University) in Beijing. Significant improvements in the Chinese higher education sphere and a tightening job market have reduced the overseas graduate premium.